Another high end Japanese Restaurant in town, introducing MOMOZEN! Got the chance to try a few signature dishes here, its located at The Plaza Building at 46th Floor. 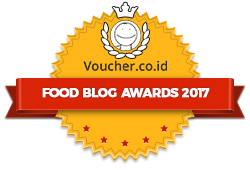 We were actually invited by Nibble App to visit this restaurant and we tasted 5 different dishes from their Tapas to their main course. 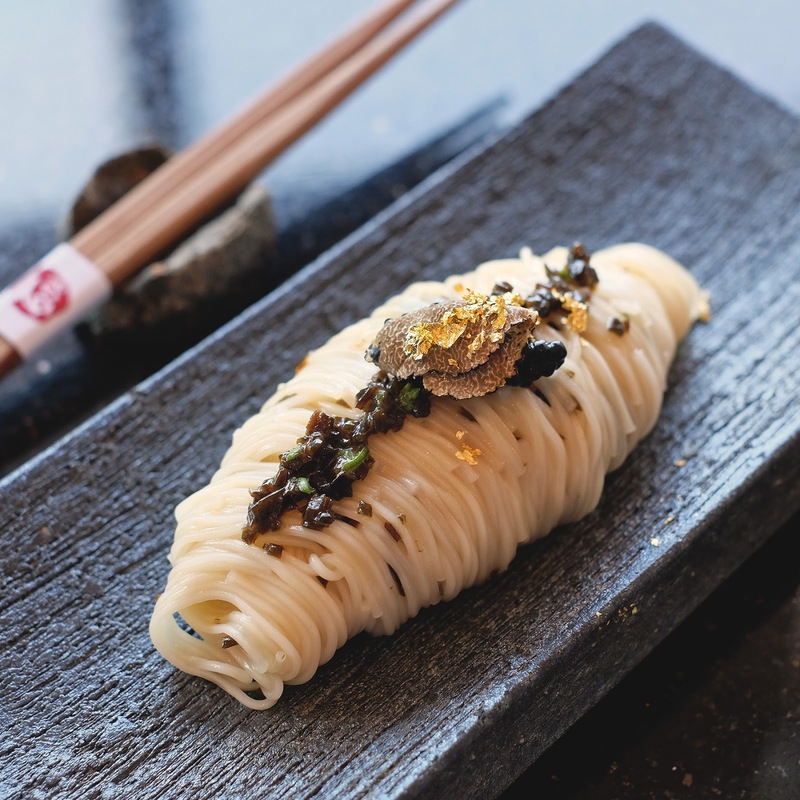 The first picture above is their best selling Black Truffle Somen with Caviar (80K), its a cold served somen or angle hair noodle neatly plated with an intense truffle flavor. I was totally sold with this one, it was really addicting! Size wise it was petite actually, so eat with care :p This gonna be a very short review, so let's go! 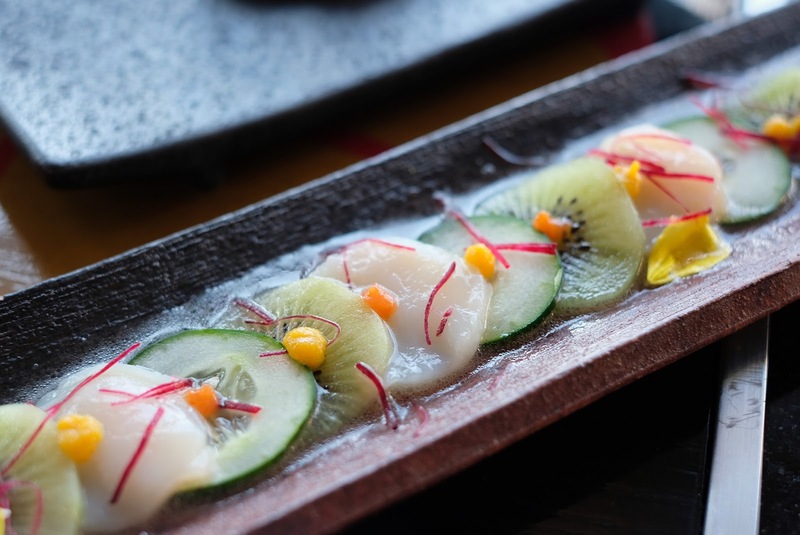 Hokkaido Hotate Carpaccio - Japanese Scallop, Kiwi, Kyuri, Umami Ponzu, Mango Chili (160K). A refreshing tapas with 3 main elements: cucumber, kiwi and scallop, with a sour hint of mango. Best eaten with 3 elements together in one mouth. But I guess its somehow overpriced if its 160K for that petite portion. 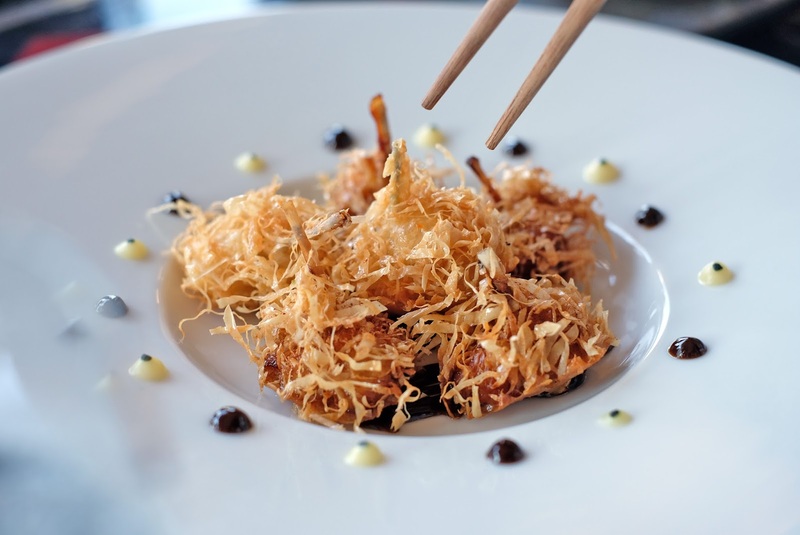 Yuba Frog - Minutes marinated fresh frog leg, black mayonnaise, garlic puree, spinach coulis (80K). OK forget about the definition, basically this is fried frog leg with a texture similar to steamed fish actually. It was really smooth like when you munch it, you don't even know its actually frog! A highly recommended one if you haven't even tried frog! 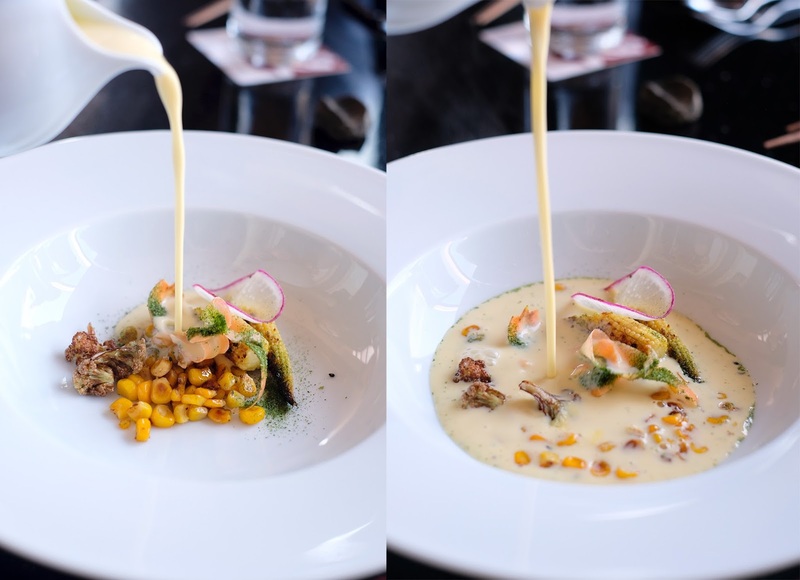 Tomorokoshi Soup - creamy corn soup, charred cauliflowers bits, nori powder (80k). Sorry I didn't really get the idea of this soup, because the soup was very thick and kinda milky with that tiny elements of corn, cauliflowers, and baby corn didn't really stand out to my palette. With that presentation, I also don't think the 80K price tag is worth it, again very sorry. 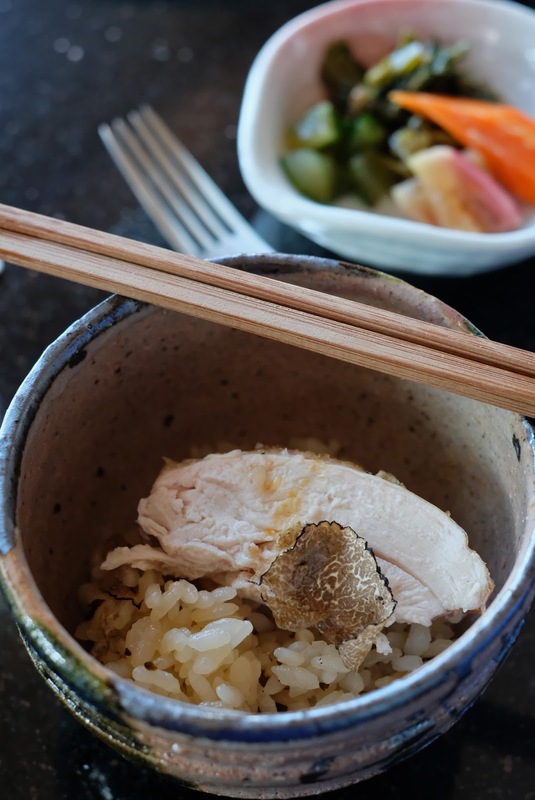 Baby Chic Truffle Rice - charcoal grilled whole baby chicken stuffed with truffle butter rice (380). 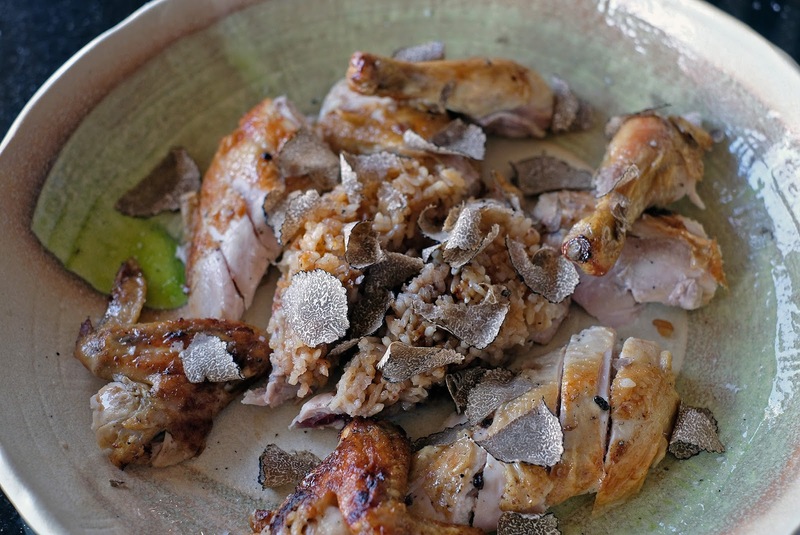 So the truffle butter rice is cooked inside the whole chicken and then when its served, they put some more slices of fresh truffle. Very fragrant and the chicken was very moist. Its perfectly shared for two - three persons. 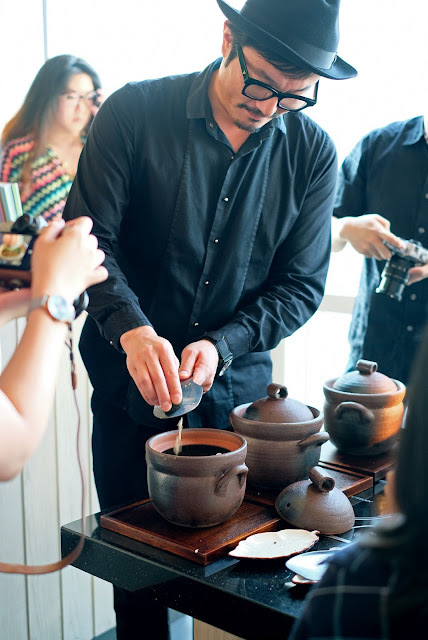 Truffle Donabe Gohan - Momozen signature fresh truffle rice (320K) cooked in Japanese claypot. The chef itself presented the dish on our table! Basically its a japanese rice similar to fried rice with a strong smell of truffle. The rice itself is rather fat and shorter than a normal rice. This should be paired with a protein main course.